Apple iTunes allows for the full backup of all your iDevices on your computer. Just create a backup of your iPhone’s contents, but have no idea about where the iPhone backup file is located? You’re in the right place. Here we’re going to look at the iTunes backup location on Windows and Mac, and the way to change the backup location. Also, you’ll find a simple way to view the details of iPhone backup contents on your computer. By default, iTunes will place the backup files to the following path. Check it out. Note 1: The Application Data/AppData is a hidden folder in Windows. So you must turn on “Show hidden files and folders” option in Windows to see that folder. Note 2: The “~” represents your home directory of Mac OS. If you don’t see Library in your Home folder, hold Option and click the Go menu. 1. Open iTunes Preferences. For Windows users, choose Edit > Preferences; for Mac users, choose iTunes > Preferences. 2. Click Devices and select the backup your want to remove. Then click Delete Backup to delete the selected backup. Note: Want to restore your iPhone, but unfortunately find the backup file have been deleted by mistake? Don’t worry. You can use iPhone Data Recovery to recover deleted files from iPhone 5S/6/6 Plus/6S/6S Plus directly. Apple does not provide a direct way of changing location where the contents of iDevices are backed up. Here we’ll share quick ways for Windows/Mac users to easily move their backup for iTunes to another disk. 1. 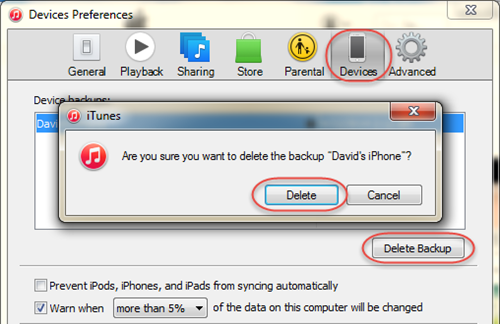 Ensure that iTunes is closed and navigate to the folder where your iPhone backups are. 2. Move the backup folder from C: Drive to the new desired destination via a simple drag and drop. 3. From the Start Menu, type cmd.exe. Open the Command Prompt, right-click it and choose Run as Administrator. 4. From the Command Prompt, type mklink /J “%APPDATA%\Apple Computer\MobileSync\Backup” “the new location of the backup folder”. 5. Press Enter and wait for Windows to create a symbolic link to the new folder from the old one. 1.Make sure that iTunes isn’t running. 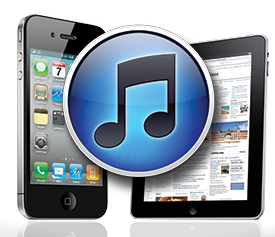 Move your iTunes backup folder ~/Library/Application Support/MobileSync/Backup/ to the location of your choice. 2.Launch Terminal Applications/Utilities/Terminal on your operating system. 3.Once launched, type the following command line: ln -s /Volumes/DriveName/Backup/ ~/Library/Application Support/MobileSync/Backup (the DriveName would be the name of the new backup location). iTunes backup is a kind of SQLITEDB file, which doesn’t allow anyone to access or preview. 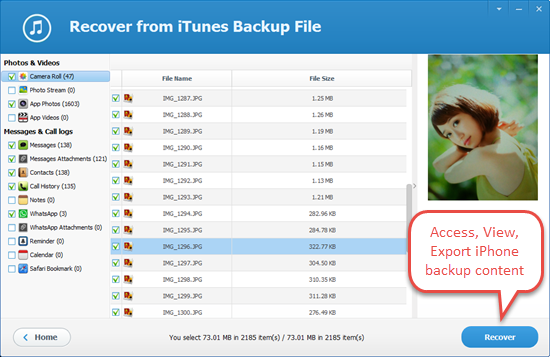 If you want to access and view iPhone backup content, you need a tool like Free iPhone Backup Viewer. This freeware can easily access to any iTunes backup file on your computer, and empower you to preview and export all data in the backup. 1.Run Free iPhone Backup Viewer. The program will list all iTunes backup files existing on the computer. 2.Choose the iPhone backup file you want to access and then click on the Next button to go on. 3.Select the file types you want to view and click “Next” to scan data in the backup file. 4.After scanning, you can view the details of iPhone backup content. Then click “Recover” to save them on your computer.